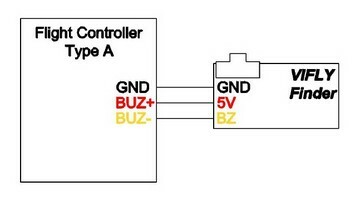 Standard buzzer depends on the power of main battery and it will not work if the battery was ejected after crash. VIFLY Finder is designed with a built-in battery that gives it the power to sound an alarm even after the quad battery was disconnected. VIFLY Finder charges itself simply by being plugged in. To easily find the crashed quad in long distance, VIFLY Finder is designed to install a very loud beeper that the DB is over 100. Simply connects VIFLY Finder to your flight controller via 3 wires, and it’s ready to enjoy your flight.